A California fight between dialysis clinics and a major hospital workers' union has healthcare industry investors and stakeholders jittery as the union gets ready to push a ballot initiative to cap private insurance reimbursements for dialysis. The Service Employees International Union–United Healthcare Workers West, one of the country's largest hospital workers' unions, has gathered more than 600,000 voter signatures for a statewide ballot measure to cut off dialysis clinics' commercial insurance reimbursement at 115% of care costs, which would slash their current rates. The union claims the proposal would pressure clinics to improve care for dialysis patients by reinvesting extra revenue into staffing and other efforts to raise standards in order to bump up the cost of care. But critics of the initiative say the measure could spur reverberating losses for corporate dialysis giants, hospitals and even state and federal coffers. Most of dialysis market in California belongs to Colorado-based DaVita Healthcare Partners and the German company Fresenius Medical Care, who have about 70% of the state market share. The 30% remaining market share belongs to independent or not-for-profit clinics. California has just under 600 dialysis clinics. California has an extra high rate of growth in dialysis patients — about 5% every year — and there are already more than 68,000 dialysis patients in the state. But SEIU members say dialysis clinic regulations are far too lax, and facilities have been plagued by issues like rat and cockroach infestations or staffing shortages that leave technicians with only minutes to clean up stations before another patient receives treatment. "With regards to staffing it's a free-for-all," said union member and longtime dialysis technician Emanuel Gonzales, who is helping to lead the union campaign and has worked in several dialysis centers across San Bernardino County and the Inland Empire in California. "They pretty much operate anyway they like. If something happens, they could blame workers." Gonzales said that as a technician he often had nine patients under his care at one time. The nature of dialysis, where a patient's blood gets removed, cleaned, and filtered back into his or her body, can intensify a patient's discomfort and need for immediate attention. The union tried last year to pass a bill that would increase the staffing ratios required in dialysis clinics, but their effort stalled in the state Assembly after passing the Senate. The measure brought out the lobbying arms of DaVita and Fresenius as well as strong opposition by provider groups like the California Hospital Association and the California Association of Rural Health Clinics. The California Hospital Association hasn't taken a position on the ballot measure yet, but the provider groups' criticisms of the staffing legislation focused on the likely shift of dialysis patients to emergency departments or hospital inpatient dialysis units if dialysis clinics couldn't meet the requirements. A coalition sponsored by the California Dialysis Council — called Patients and Caregivers to Protect Dialysis Patients — has echoed the same concerns, arguing the initiative could drive up dialysis costs as treatment moves to hospitals and emergency departments. The group, which has received funding from DaVita and Fresenius, has not run analysis of how many hospitals would need to take on more dialysis patients if the clinics in their area have to cut back or close. The coalition has determined that small and independent clinics stand the greatest risk of closure, as the 115% commercial reimbursement cap doesn't account for the costs of dialysis clinics' mandated physician medical director, clinical coordinators and administrators. A clinic closure could hurt patients as well, the group noted, citing research whoting a single missed dialysis treatment increases the risk of death by about 30%. 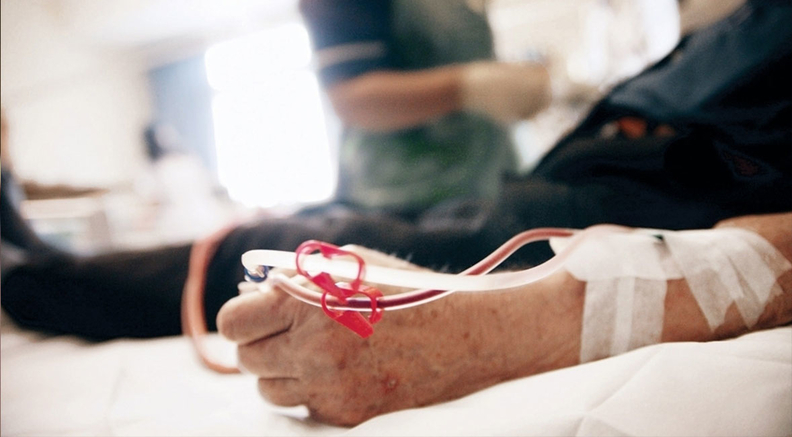 "The proposition disproportionately harms dialysis patients in poor, disadvantaged and rural communities where dialysis clinics already struggle to stay open," the coalition wrote. Ratings and financial analysts with an eye out for investors in DaVita and Fresenius are also on alert. In a note last week, Baird Equity Research predicted the union will push for legislation on staffing issues, which could mean a $100 million to $150 million hit for the industry. The ballot initiative would likely drive DaVita out of California entirely — at least a $300 million loss, Baird said. However, Baird noted that the dialysis industry has the bigger lobbying war-chest compared to the union and speculated that DaVita and Fresenius will either defeat both the staffing legislation and the ballot measure, challenge them in court or negotiate another resolution with the union. A brief from Wolfe Research also predicted the odds are in the industry's favor. "It's difficult to find examples of successful ballot initiatives against the health care sector over time," Wolfe's analysis stated, referencing California's unsuccessful drug pricing initiatives from 2005 and 2016, as well as an insurance company rate justification initiative from 2014. California isn't the only state where the union is rallying voters around ballot measures. Similar efforts are underway in Ohio and Arizona.